« Is a Humidifier Necessary in Destin? When you live somewhere as warm as we do, it makes sense that homeowners focus mostly on temperature control in their homes when considering the quality of their indoor air. Temperature control is certainly important to keep your home comfortable and your family healthy. However, it’s not the only factor involved with indoor air quality. You can be impacted by factors such as excessive humidity, dust infiltration, and even germs and bacteria existing in your air ducts. Fortunately, there are many things you can do to combat these problems. The same pros who are here to take good care of your HVAC system are also expertly trained and experienced in installing and repairing various indoor air quality products that can help keep your home as happy and healthy as possible. 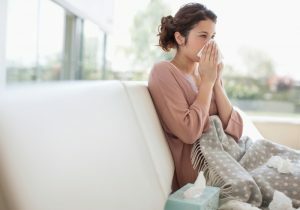 Of course, every home is different and not all households will have the same needs, but below we’ve covered a few of the most common threats to indoor air quality in Destin, and what you can do about it. You likely could have guessed this one on your own, but excessive humidity is a problem for most homeowners here in Florida! Any time the relative humidity level goes above 50%, there is simply too much ambient moisture in the air. This doesn’t allow sweat to evaporate, meaning you can’t cool off, and as a result it makes the surrounding air feel hotter than it even is. Excess moisture also encourages the growth of germs and bacteria. Your air conditioner does have some dehumidification properties, but cooling systems are not designed for this purpose. Instead, you’d do well to have a whole-house dehumidifier installed, which can lower humidity levels to the exact amount you need. This helps improve your home comfort, and reduces mold and bacteria growth in the process. It also eases the strain on your air conditioner. A dehumidifier will pay you back for your investment and more, given how long it stays hot and humid in our area. Your HVAC system comes with a basic air filter already in it, designed to strain dust and dirt out of the air as the system runs. The problem is, this filter isn’t there to protect your indoor air quality, but rather the interior components of your HVAC system itself. If you suffer in the form of allergies and asthma, from excessive dust and allergens, then you’d do well to consider the installation of an electronic air filter and/or an air purifier in Destin, FL. Either one of these, or a combination of the both of them considering how severe your indoor air quality problems are, will make your indoor air much cleaner than it may be otherwise. Remember that humidity we mentioned above? Well, it exists within your ductwork, as well. And true, if you have a whole-house dehumidifier installed within your ductwork, it does help alleviate the excess moisture a bit. But your ductwork could use a little extra help—after all, its wet, dark environment provides the perfect breeding ground for mold, mildew, and other bacteria. UV lights, however, eliminate this problem. They are completely harmless to people and pets, but effectively destroy microorganisms such as mold and mildew. Contact Kool Breeze of Northwest Florida, Inc. for expert indoor air quality services.